In contrast to her usual motherly charms, Cathy Mitchell’s expression appears vaguely menacing, as if she is ready to pounce with that skillet in her hand. The ominous sentence that appears next to her ”Don’t cook another meal without it!”becomes a threat she expects to enforce in the worst possible way. 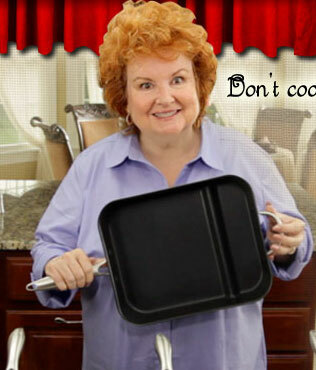 The infomercial for the Sideshow Skillet lacks the implied intimidation found on the website. The commercial just demos of all the amazing things the product can do in the kitchen and will be of interest mainly to the legions of fans who just can’t get enough of Cathy Mitchell. You may want to note, however, the obviously dubbed-in audio during the “sneaky snacker” spiel at 1:19-1:23. The Sideshow Skillet actually seems like a worthwhile product. No silly gimmicks and a pleasant hostess who allows the product to sell itself. And yes, that portion from 1:19-1:23 is very obviously dubbed. But there’s no apparent reason than perhaps an audio problem or unexpected background noise picked up during filming; the recorded track matches up with what she’s saying on film, so we know she didn’t say anything different from what she said on-set. Cathy Mitchell and Chucky…what a wacky pair of redheads! 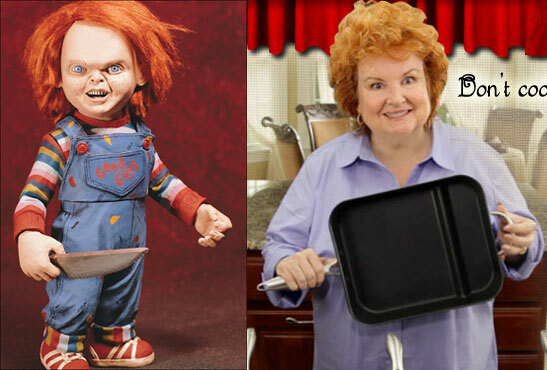 If Chucky actually did the infomercial for the Sideshow Skillet then I might actually consider buying. I was curious about Cathy and research led me to this site. I have to agree with the majority she has a maternal quality about her that people enjoy and trust. I personally enjoy watching any of her informercials and seeing her work her magic, just as I enjoy watching Norm Abrams working wood on New Yankee Workshop. She does have a great talent! I have used one of her products (the turbocooker) and the damn thing did do what she said it would. While not the best made, it did work and the recipies were really good. Cathy doesnt make the products and if they do malfunction or fall apart it isn’t her fault. However, just like bad reviews on Emerilware pots and pans, I wish we could see some action from the hosts to try and correct the problems and deficiencies. I ordered the SIDESHOW SKILLET 3wks ago. Tried to write to the company. No reply. Tried to call the company. Said number was not in service. Buyer Beware: Please call, before you order this product.